Last night, I took a road trip to Yorkville, IL. The city had a festival at the park. There were the usual carnival rides, and carnival food. A band called Carrollton was playing too. http://www.carrolltonband.com/ They are a Christian band that you hear on Christian radio a lot. I arrived a little over an hour early. There were tables around, but they were reserved for the sponsors of the festival. There was one unmarked table with someone sitting at it. We started talking and I found out he was there to help the band unload and load the trucks. Soon the concert started. Time for action. I grab camera and went on a mission. The band started playing while it was still light out. There was the evening glow as the sun went down. I love capturing facial expressions of the band members. The put a lot of effort into their music. As the sun set below the horizon, the lights started coming up. that is when I have the most fun with camera. It can be difficult with the changing light intensity, but the mood and expression is what I look for. The group sings Christian music and tries to make people think more about God, and bring Christ centered family time for people to enjoy. Shooting somewhat from the side, I was able to capture this one. I was shooting between all sorts of support rods for the set. Time and patience pays off. This was a small venue for the band. Hopefully I will be able to see and photograph them at a bigger venue some day. 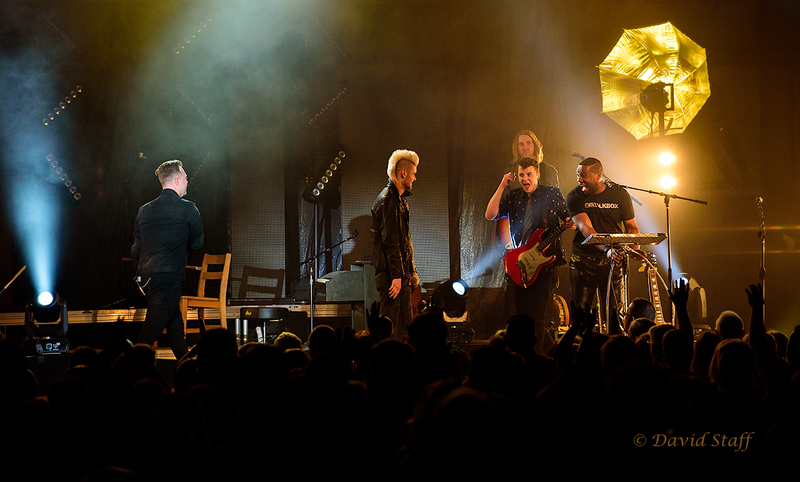 Carrollton, thanks for a great night of music and Praise. A place not visited often. A divisor of nations where they come together. A place of peace for those who appreciate it and will seek it out. A road not traveled often. And, on a river that divides USA and Canada. I find myself immersed, consumed and overwhelmed. Tranquility is what this place means to me. Time alone was one of the things I was seeking. Silence that was louder that I could talk, is what I found. The peacefulness in the power of water and rock that senses soak up. Two worlds apart, but still together. That is one of the things I thought of while sitting here and when looking back to the time spent there. Sitting in the USA, on the bank of a river that pounds the senses and still calms the soul with Canada on the other side. Times like these are treasures to enjoy. Life is full of these things. Looking into this picture, there is no one thing that made up the experience that brought me to this moment captured with the camera. Everything seen, heard, felt, smelled, and tasted made up this experience. For an hour my experiences changed. Amazement, wonder, fear, filled my mind and emotions. Who has been here before? Who has hunted here before? Were treaties, weddings, friendships, heartaches, acted on, or pondered here? Everyone who sat here has experienced something similar, yet something different from other guests. One person observes experiences in one way, while someone else may see things slightly different. Seeing with your life experiences is a lot like seeing with a camera. Where you are standing is part of your vision. Moving to the left or right, or up and down changes things. Time will change things too. The more time you spend somewhere, the more you may be able to see. Looking, walking and sitting someplace takes time. Time that allows you to experience. This is a place of power and peace. A place of comfort and refuge from the daily life. God made places like this, where we can view His mighty creation, and be in awe of of His power, intelligence, and the peace He can bring. Last fall, I was able to photograph another concert. Again, it was at First Christian Church in Clinton, IL. Four groups played this day. “The Afters”, “Chris August”, “Unspoken” and “Among The Thirsty”. It was a great time for sure. Lots of great music. Music that gave honor to God. And proceeds going to a great cause. “Fan the Flame Christian Concerts” http://fantheflamechristianconcerts.org/ tries to have the monies going to the bands be donated from local business and individuals. The ticket sales then go to different charities. This is a win win situation for the people wanting to see the bands and for organizations that are supported from that performance. There will be more concerts in the future. The next one will be Sunday, January 31, 2016 @ 5:30 PM in Clinton, IL. The band will be Carrollton. I will not be able to make it this concert, unfortunately. But, I know those who are able to be there, will not be disappointed. Just as in past concert, like the one I am showing pictures for now, the next one should be great. I appreciate that Randy and Ann Anderson, have the vision to bring bands like these to central Illinois. I am looking forward to many more. I thank the Andersons, Fan The Flame Christian Concerts, and First Christian Church in Clinton for bringing these band in for us to see. If you get a chance to go this weekend, enjoy. Sing a song, tap your foot, and take a picture for me while you are there. And remember, to God and Jesus Christ be all honor and praise. One of the ways I enjoy spending time on vacation is getting in the truck and driving. I may not know what I am looking for, but I am always looking. It is invaluable to have paper maps and GPS in hand. After spending some time scouting for hawks at the Hawk Ridge area and not being successful, the pavement gave it familiar call. Wanting to take it kind of easy, I stayed on the hard road. Driving north along Lake Superior there were many sites to be seen. Houses, beaches, places to eat and islands peaking through the tree lined shoreline. It was starting to be get dark out and I had not found the image I was looking to capture with camera. As mentioned, the hawks did not come in as I had hoped. Driving, I saw a lot of pretty sites, but none that really moved me. Using the topo maps on the GPS, I saw an island coming up ahead. Islands are always worth investigating further. I could see there was a road leading down to a place where the island was view able. So many times, that does not happen. There are trees in the way, or other obstructions making picture not possible. Driving down a narrow steep road, the days plans came together. The sun had all but gone down, and there was a glow on the opposite horizon. The island was picking up some of the last light. I had a foreground on top of that. I love wide angle photography. That is my first love in photography. Getting out tripod, I did say tripod, I brought camera close to ground. Using a remote shutter release, I started capturing time as it moved on in front of me. Light was changing and time was working for and against me. Against me, as I did not have much time. For me, as it was painting the scene in front of me. Knowing there is always more that one image in a picture, I rotated camera and recomposed. When, scene, light, and time come together, magic happens. This was one of those moments. Saturday was a good time. 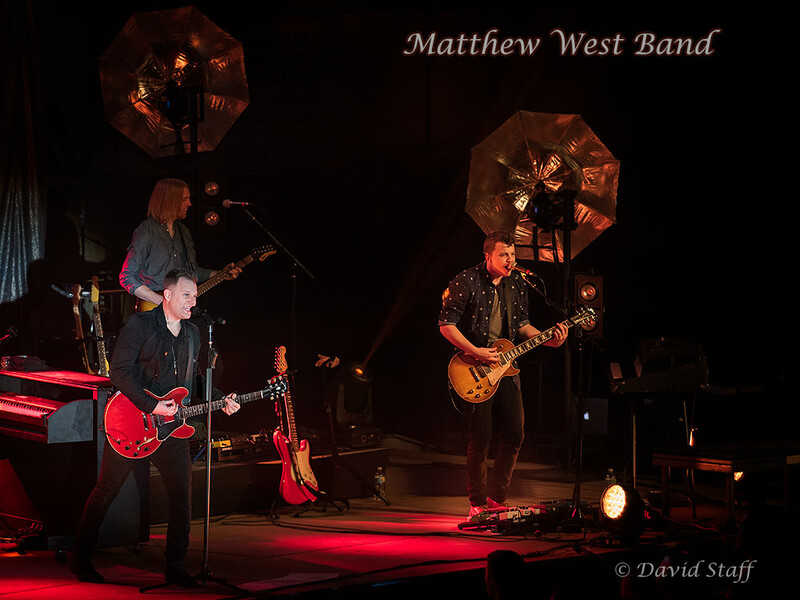 Matthew West came to play in Decatur. Matthew is from Downers Grove, IL but spent his college years in Decatur at Millikin University. 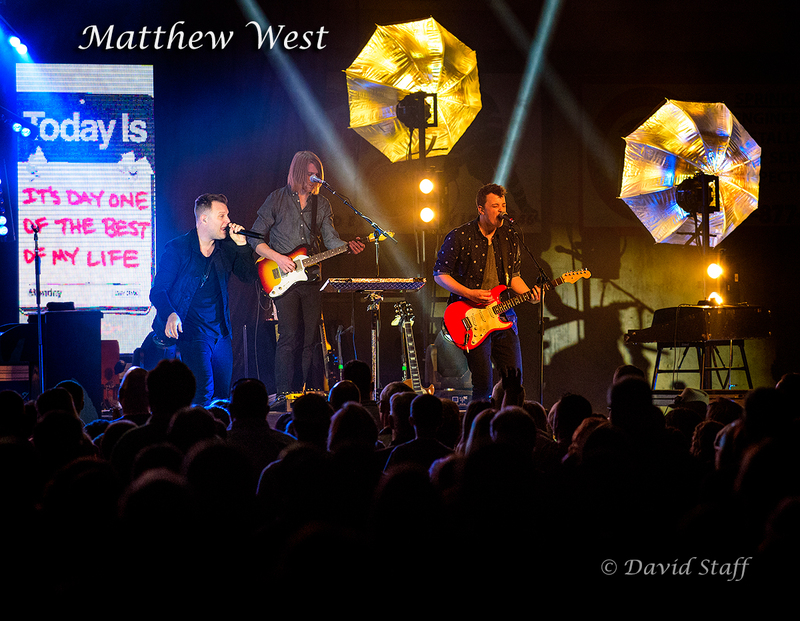 Matthew has won many awards in the music business and has written songs for many top musicians. He uses his talent to spread the Gospel of Christ with his Music. To listen to his music is a treat. There is another Decatur connection in his band. The drummer also attended Millikin. That says a lot about the quality of musicians that Millikin University produces. 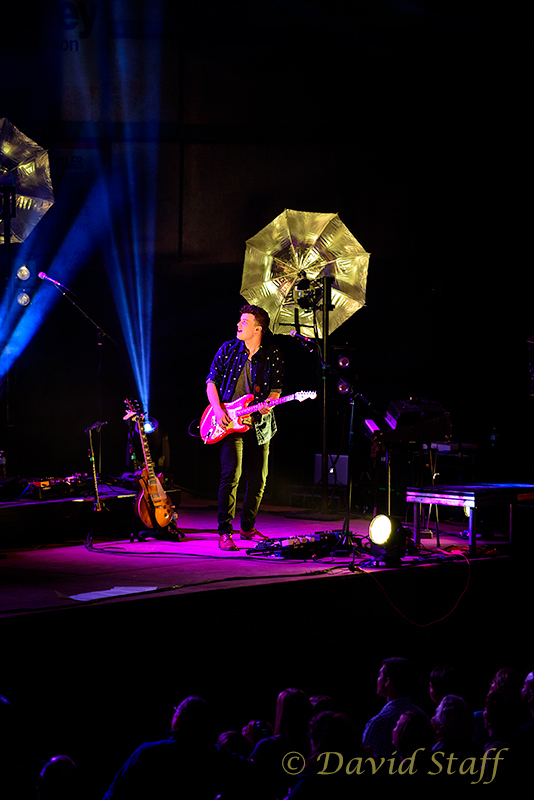 Another strong Decatur connection is the guitar player Jake Widenhofer. Jake is a Decatur native, and his father is the head of the Music Department at Millikin. 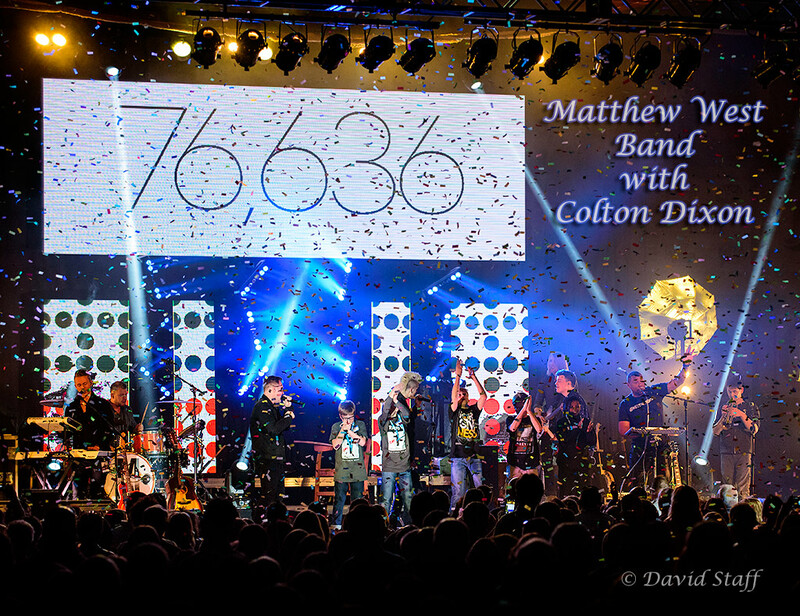 As Matthew mentioned in the concert, it was a great time returning to Decatur. He even mentioned his favorite burger from Kreckel’s. Before the scene below, Matthew talked about how our sins and heart aches can be taken away by God. He took several pages of paper with lists of heartaches that people have written to him about and tore them into shreds. Then falling from above were tiny pieces of paper to represent all of the things that God can remove from our hearts. To know you are forgiven and to know he can heal the broken-hearted, is the joy that Christians know. To know the hope of heaven waiting for those who love Him is a comfort that God gives. I did not make the beginning of the concert. Colton Dixon who was on American Idol also, performed. I did hear him play some with West’s band. There was a lot of talent in Decatur that night. It was a fun night of entertainment with other Christians and the presentation of a great message. Dusk is always a challenge to photograph. You are working with low light. There is a change of shift in the bird world. Day birds slowly disappear and night birds start showing up. This barred owl, came out to investigate me. There actually were two for a few moments. 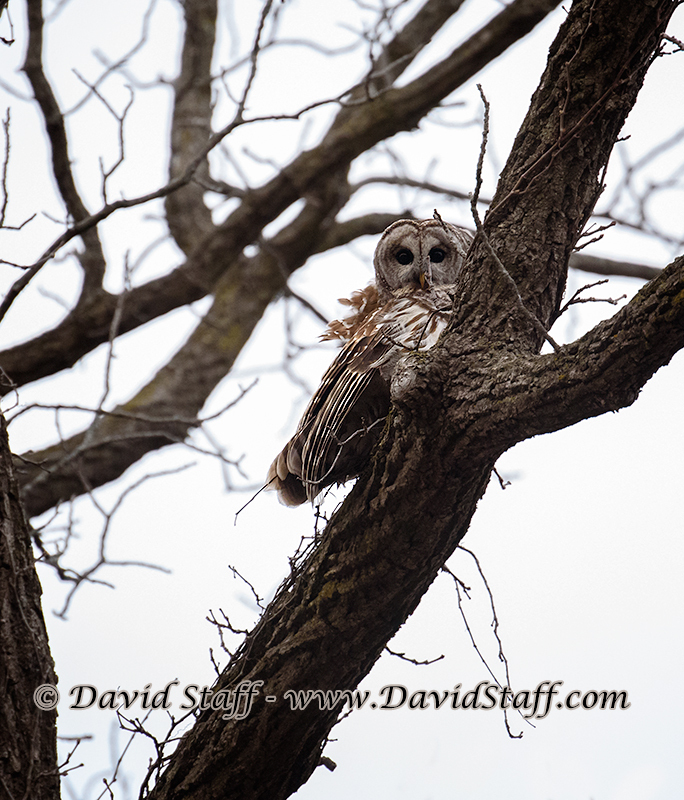 Barred owls are easy to find if you listen for them. They sound like, “who cooks, who cooks for you all”. You may be able to hear them call, but they silent when the fly. This gives them an advantage when hunting. Great eyesight and stealth flights, give them a great advantage at night. With Spring working its way in, baby birds and animals will start making themselves known. Sometimes you are lucky to find photo opportunities on your own and other times people will share those great places with you. 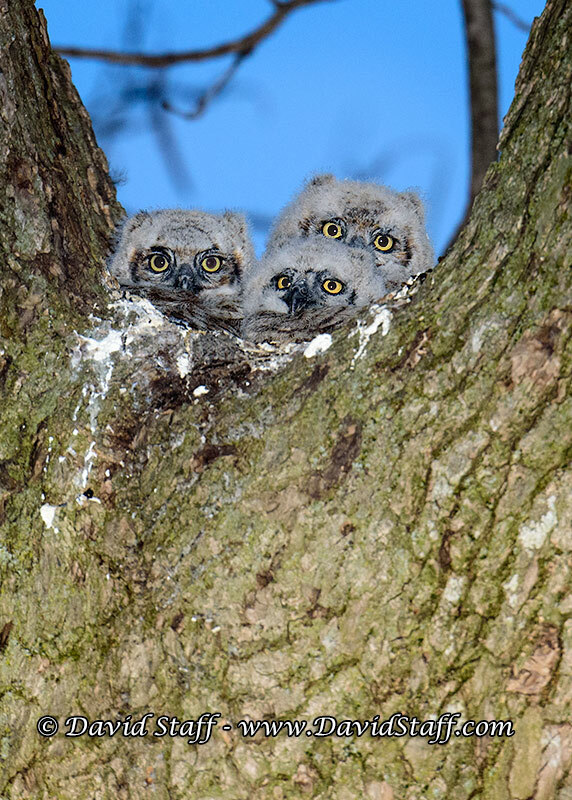 A co-worker and birder told me he had a nest of owls in his neighborhood. He said it was a couple of houses down from where he lived. He and his girlfriend had been enjoying them for a few weeks and had enjoyed hearing the parents all winter. Not having opportunities often to photograph owl chicks, I headed out. It is a 25 minute drive to the nest site from my house. People ask, why would you drive 25 minutes to see a bird’s nest? Because when the opportunity presents itself, it can be a real hoot… I know, I could have chosen my words better there. It was fun watching the owls. One of the parents was watching me too. It was a nice evening and I was even able to talk with one of the neighbors who was excited to have them nesting nearby. Hopefully I will have more of these kids as they grow up and leave the nest.